Paris poison plots, multibillion-rand bailouts for SAA, SABC and who knows what other state-owned entities (SOEs), hits on bodyguards and skipping an appearance before a Parliament oversight committee because of dental surgery. It’s getting curiouser, and you can’t make this up. By MARIANNE MERTEN. Chair of the board of the unable-to-repay-loans-or-suppliers national carrier, Dudu Myeni, was in Cape Town, the seat of Parliament. She was just not in town for the finance committee meeting with SAA, but for a tooth extraction, a day earlier. This the Finance Deputy Minister Sifiso Buthelezi confirmed – “she sent me a doctor’s letter” – after the committee indicated that “we are unable to trace her”. So although Myeni’s date was with MPs, the apology went to a member of the executive, a different and separate sphere of the state. 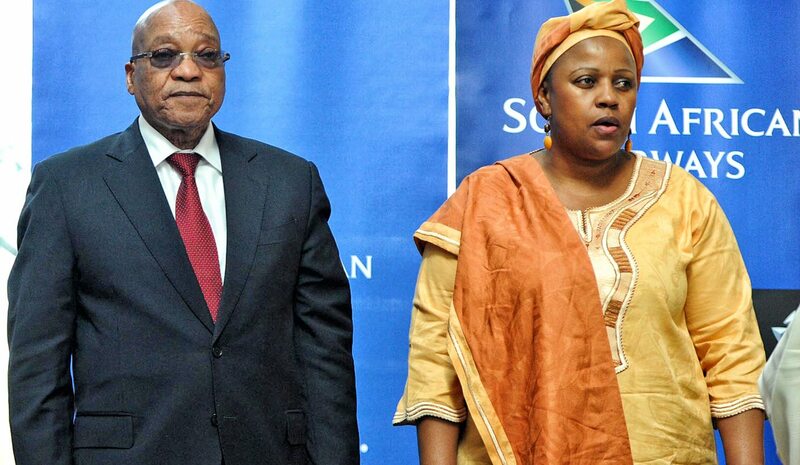 Perhaps its an indication that Myeni, who is also chair of the Jacob Zuma Foundation, is able to set the agenda. To date government, SAA’s sole shareholder, has always coughed up when asked. In June it was R2.2-billion to cover due loans the national carrier failed to renegotiate, at the end of September it is set to be R6.8-billion. In addition, R2.4-billion is required as working capital until March 2018. And that’s not the end of it as various loans SAA has taken out with 12 banks against government guarantees worth R19.1-billion mature at different times until 11 December 2020, according to documents SAA provided to the finance committee. To put it into another perspective: government’s SAA guarantees amount to almost two-thirds of the controversial arms deal in 1999. The R30-billion price tag for the Strategic Defence Package ballooned and critics still today raise questions about what South Africa actually has gained from it. And questions should also be asked of SAA, whose documentation delivered to MPs showed it has just 104 “captains”, or pilots, for its fleet of 60 aircraft. Given limits on pilots’ flying times – the international standard is eight hours in every 24 hours for one pilot behind the controls, and 12 out of every 24 hours for two pilots – it is unclear how SAA planes keep on flying. Also in the financial headwinds is South African Express (SAX). It cannot file its annual report and financial statements as it cannot demonstrate that it is a going concern – and therefore stay in the air. This emerged in a letter from Public Enterprises Minister Lynne Brown to National Assembly Speaker Baleka Mbete, requesting a postponement to an unknown date of the tabling as published in the Announcements, Tablings and Committee Reports (ATC), Parliament’s record of work. Effectively, 15 months of government looking at potential mergers and/or an equity partner has produced mahala. The R11-million SAA has spent to fly the South African Football Association (Safa) can’t be recouped as this is a sponsorship deal in place since April 2017, according to a recent parliamentary reply to DA MP Alf Lees. And for now the rands and cents continue to haemorrhage, much to the chagrin of MPs, for the maintenance of an office and call centre in Miami, US, and offices in other places around the world, some in places SAA doesn’t actually fly to. But there’s good news. The Angolan government has promised to repay its debt to SAA, according to Deputy President Cyril Ramaphosa during his question time in the National Council of Provinces (NCOP). And with a bit of luck, Zimbabwe, Nigeria and Senegal will follow suit to settle a debt of R1-billion that has been outstanding for a while. Maybe it’s not enough for an increasingly strained public purse that is missing R13-billion as tax collection has fallen short of target with weeks to go to the financial allocation adjustments of Finance Minister Malusi Gigaba’s maiden Medium-Term Budget Policy Statement (MTBPS), but every cent might help given demands by various SOEs. The communications committee was told the SABC had requested R3-billion. It is being considered. It’s the glass-half-full, good story narrative preferred by government, and any anniversary, launch or manufactured occasion will do. On Tuesday evening it was the celebration of the 5th anniversary of Parliament which, in rare unanimous approval, voted for the National Development Plan (NDP), South Africa’s blueprint to reduce poverty, inequality and poverty by 2030. It was all about NDP in action, in progress and in implementation, yet just hours after the SAPS told MPs they were still looking at the NDP recommendations of a demilitarised, professional police with a board to oversee top appointments. And the evening’s speeches did not once mention, even if only to refute, the findings that South Africa was actually missing targets and heading in the opposition direction, deepening inequality and poverty, that arose from Statistics South Africa’s recent Poverty Trends report. As President Jacob Zuma delivered the keynote address at one of Cape Town’s posh hotels, nowhere to be seen was Ramaphosa, one of the NDP architects. His good story telling time was the next day in the NCOP, even if his optimism was challenged just a few hours later when the finance committee raised questions over the legality of Myeni’s extension of term as SAA board chairperson. Of course, Moyane’s comments to MPs darkened the cloud of bias and political machinations over the NPA and the Hawks, which went after Gordhan once Moyane’s CAS427/5/16 was opened on fraud charges related to an official’s early pension payout when Gordhan still headed SARS. The charges were aborted when it emerged that an in-house legal opinion found nothing untoward in this. This stands in contrast to the apparent lack of enthusiasm in both institutions over the #GuptaLeaks, as they stand criticised for stalling investigating the leaked emails’ revelation of dodgy dealings in SOEs.